After having lived on its reputation for too long, Honda found itself in the late 1970s with an outdated range. That is why 1977 saw an impressive flowering of new models, of which the undoubted star was the CBX 1000 Six. 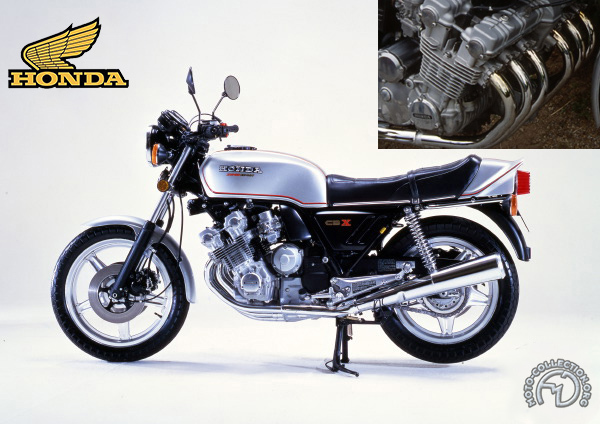 Superb and original, this outstanding bike had as a primary objective the revitalization of Honda's image. Like all the new models, which had preceded it that season, the CBX was the work of Soichiro Irimajiri, an engineer of inexhaustible creativity whom Honda had tasked with rebuilding the entire range inside two years. The new Six shared the two main characteristics that distinguished the Hondas of that period: technical originality at any price and a power output at least equal to 100 hp per liter. Designed like a flagship model, it offered a standard of refinement and finish that was unknown in mass production. The Six proudly delivered 105 hp, which made it in fact the most powerful 1000cc machine, of which Honda took advantage by promoting the CBX as a sports bike (which it wasn't). Handicapped by its massive engine and a diamond frame which lacked rigidity, the CBX was never going to be noted for its road-holding. On the other hand, the incomparable smoothness of a straight-six's performance combined with the fine built quality of the machine made the CBX a real grand tourer capable of arousing unique sensations, and it duly evolved along these lines with the Pro Link model. The CBX is still one of the high points in Honda history. Shown inset is one of the many styling studies for the definitive CBX.